Juventus boss Massimiliano Allegri heaped praise on Cristiano Ronaldo, claiming that the Bianconeri are fortunate to have Ronaldo on their team. Ronaldo arrived at Juventus from Real Madrid last summer to boost the chances of the Serie A giants in their quest for UEFA Champions League. The five-time Ballon d'Or winner has taken Italian top flight by storm and portrayed his caliber in the Champions League. Succumbing to a 2-0 defeat against Atletico Madrid in the Round of 16 first leg, Ronaldo netted a hat-trick in Turin to singlehandedly help Bianconeri qualify to the Quarter Finals. 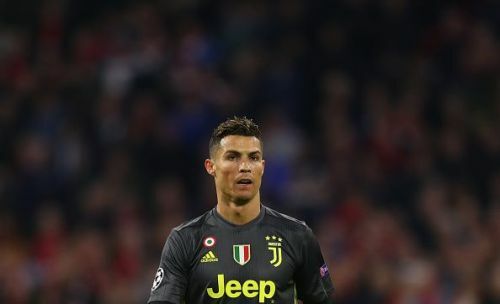 Against Ajax, Ronaldo netted a goal with a diving header to give Juventus the away goal advantage as the match ended 1-1 at Johan Cruyff Arena. With 25 goals and 12 assists in all competitions, Ronaldo has proven himself to be indispensable in the current Juventus squad. On the other hand, Allegri has been at the helm of Juventus for the past few seasons and has delivered huge success in Italian top flight. But after getting knocked out by Real Madrid twice in the last three years thanks to Ronaldo, Allegri is yet to fulfill the Bianconeri's European dream. "Cristiano has this extraordinary quality, which is that when the match arrives, he changes. You can see it in his face. He's in better shape physically than he was last week." "I can say that it would have been weird if Juventus were knocked out from the Champions League with a single goal scored by Cristiano." "He then scored three against Atletico and one at Ajax. Fortunately, we have Cristiano [at Juventus]." Juventus will welcome Ajax in the second leg of Champions League Quarter finals on Tuesday night. The match is evenly poised after a draw in the first leg but Juventus will be careful not to repeat the mistakes of Real Madrid, who were knocked out by Dutch side in the Round of 16.